The health impact of pets on older people is explored in a new report published by the International Federation on Ageing (IFA). 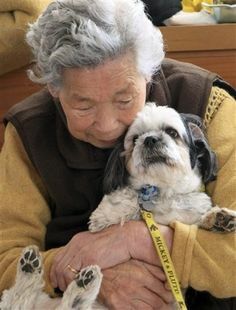 The report Companion Animals and the Health of Older Persons provides a literature review into the ways pets contribute to the physical and mental health of individuals and the well-being of society. “This field of research has important implications across generations and also for the future of our broader societies,” said Dr. Jane Barratt, International Federation on Ageing. “Many studies have broadly discussed how pets, such as dogs and cats, contribute to health by reducing anxiety, loneliness and depression, but until today have not yet been published in a single resource. This new report advances our understanding of the value of companion animals in the framework of human health and the broader society,” she said. "The interaction between humans and animals is powerful; animals can educate, motivate, and enhance the quality of life for people around the world", said Michael Devoy, chief medical officer, Bayer HealthCare, which sponsored the report. “Given the scope of this report, we are excited that this research has the ability to reach human healthcare practitioners, veterinarians, doctors, nurses, gerontologists, and social workers,” Mr Devoy said. This report is the most extensive literature review to date of research undertaken in the field of companion animals and the health of older people. Encompassing published research from 1980 to 2013, it considers the impact on the physical, psychological, emotional and social health of older people, both in the community as pet owners and as residents of care facilities and other institutions to whom animals are introduced for recreational and therapeutic purposes. The economic impact of companion animals is also considered. Despite limitations and gaps in the research caused by weak project design or poorly-controlled studies, the positive indicators of improvements to the health and well-being of older people are encouraging and affirm the value of future research in this field.